According to Larry Parsons of Warner, I'm "preppie". The aforementioned liberal letter writer had a letter-to-the-editor on Friday. Parsons railed against conservatives, and then turned to discuss State Rep. George Faught and me. First of all, the standby accusation from the Democrats when it comes to Rep. Faught is that he's "in the pocket of Big Insurance" (just like his "pal", the other George: George W. Bush). EDIT: An interesting note on Rep. Faught being "in the pocket of Big Insurance" - during his last campaign, I believe less than 5% of his campaign contributions were from insurance PACs or those employed in the insurance field. Nothing like the Democrats, whose candidates are commonly funded 75% or more by lawyers and unions. Here's the video from the August 24th Muskogee City Council meeting. There is an old saying that time cures all pains; while some may believe that statement, I have some reservations. Anyone that engages in terrorism is very low on my scale on what it takes to be human being. When I watched the Twin Towers fall on that day in September not that long ago, I could not feel any compassion for the people or the nations that would condone such an act. Whenever you could watch on live TV your fellow Americans jumping to their deaths to avoid being roasted alive, why should anyone have any compassion for anyone involved in these kinds of acts? Earlier this week the government of Scotland released a terrorist from Libya that was responsible for the deaths of 270 people on December 21, 1988. I realize that 1988 was a long time ago, but I am sure that the families that lost loved ones in the bombing of the Pan Am flight over Lockerbie, Scotland feel as if it happened only yesterday. The Libyan citizen that was convicted for this crime had been in prison since he was found guilty of the crime. The Scottish government cited compassionate grounds in their decision to let Abdel Baset al-Megrahi return to Libya because he has prostate cancer and was given only months to live by British doctors. In my opinion anyone that is guilty of such a barbaric act deserves very little compassion. I was also appalled by the welcome that the people of Libya gave this individual when he returned home. We need to remember that the families of the victims of the Lockerbie bombing will never be able to give their loved ones a homecoming. I realize that the country of Scotland had jurisdiction on this case, but they need to decide if they are going to tolerate terrorism in the world. In the world we live in today, borders mean very little. Acts of terrorism can affect people from across the world; the bombing in 1988 killed 270 people, most of them Americans. Acts of terrorism are directed at civilians and the terrorists are not concerned about nationalities, they simply want a huge body count. In many countries individuals guilty of these crimes would not have lived for the past 21 years. The act of compassion that allowed him to live for 21 years was more than he deserved. His actions showed little compassion for his 270 victims in 1988. If you want to contact Russell Turner, or wish to subscribe to his email loop, click here. The following was received from the congressional campaign of Republican Daniel Edmonds today. MORRIS, OK – Daniel E. Edmonds, a life-long native of Morris, Oklahoma has filed candidacy papers with the Federal Elections Commission (FEC). In addition, Edmonds’ campaign committee “Edmonds 2 Congress” has also filed a statement of organization with the FEC. Edmonds will be seeking the Republican nomination for Oklahoma’s Second Congressional District seat, currently being held by Democrat Dan Boren. Born the fourth of twelve children, and raised on the family’s small farming/ranching operation, Edmonds knows the importance of dedication, dependability, and discipline. Having been taught traditional conservative values at home, Edmonds further honed his values through the FFA Organization while in high school. After graduation from Morris High School as Salutatorian, Edmonds attended Oklahoma State University in Stillwater, where he pursued a bachelor’s of science in plant and soil sciences. While completing studies, Edmonds took a semester from his studies to serve as the Agricultural Legislative Intern at the State Capitol in Oklahoma City. Having his interest in government heightened, Edmonds then traveled to Washington D.C., where he served as the Agricultural Policy intern under Congressman Frank D. Lucas, (R, OK-3). While in Washington, Edmonds learned a great deal about the internal, day-to-day operations of a U.S. Congressional office. After the two legislative internship experiences, Edmonds returned to Oklahoma State University to complete his bachelor’s degree. With an interest to continue learning, Edmonds stayed at OSU to pursue a master’s degree in plant and soil sciences. While working on master’s studies, Edmonds had the opportunity to travel to Zimbabwe and Uzbekistan, presenting research and knowledge learned here in Oklahoma to farmers, ranchers, government officials, and scientists. Edmonds received the Phoenix Award, Oklahoma State University’s Outstanding Master’s student award. After completion of a master’s degree in plant and soil sciences, Edmonds furthered his education by pursuing a doctoral degree in soil science. While working toward completion of this degree, Edmonds has traveled to Russia and Mexico. In all, Edmonds has traveled to nine countries on five continents to represent OSU and Oklahoma in presenting agricultural methodologies to the third world. Edmonds is currently working towards the completion of his doctoral degree. In addition to his duties as a Research Fellow with Oklahoma State University, Edmonds also works on the family’s farming/ranching operation near Morris, OK. Edmonds also aids local farmers on their operations as well, and serves as the Pre-kindergarten Sunday school teacher and editor/publisher of his church’s weekly bulletin. Edmonds is planning a formal announcement of his candidacy for September 5 in Morris, Oklahoma. For more information or to schedule Edmonds for an event in your area, contact the Edmonds 2 Congress campaign office (918) 733-2068, or visit the campaign’s website http://danieledmonds.org. Edmonds is one of three GOP candidates running against Democrat Congressman Dan Boren. You can learn more about Edmonds by visiting his website here. The other candidates so far are Dan Arnett and Howard Houchen. 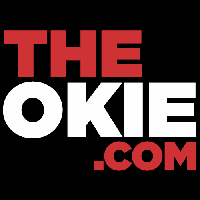 At this point, we have not endorsed any candidate, but we will post information on this blog whenever we find or are sent anything on candidates. 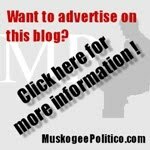 If you know of a candidate who has not been covered on Muskogee Politico, or want to contact us on anything else, send us an email here. City Councilor Jim Ritchey has announced his intention to run for Muskogee mayor in next April's election. The seats that will be open for election next spring are Ward I (David Jones' seat), Ward II (James Gulley's seat), Ward III (David Ragsdale's seat), Ward IV (Jim Ritchey's seat), and the mayoral seat (currently held by John Tyler Hammons). The other seat from each ward is up 2011. Ritchey's announcement means that at least one city council seat will be up for grabs. Rumor has it that Ward I and Ward II may be open seats in the next election as well. You can read the Muskogee Phoenix's article here. Congressman Dan Boren is holding three town hall meetings today: one each in McAlester, Muskogee and Pryor. 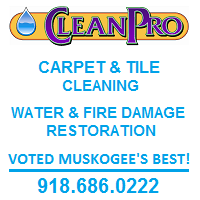 McAlester - 8 a.m. to 10 a.m.
Muskogee - 11:30 a.m. to 1:30 p.m.
Pryor - 3 p.m. to 5 p.m. I will be attending the Muskogee Town Hall, and hope to give a report on it later this afternoon. This week's 'Conservative View', from Russell Turner. For years there has been a huge debate on the abortion issue in this country. There are two camps, one being pro choice and one pro life. The purpose of this column is not to debate that issue, but to put the heath care debate into a perspective that we can relate too. To me it is ironic that the biggest proponents of the huge government takeover are for the most part pro choice in the abortion debate. The founders of this country created our form of government to have as little impact on the citizens of this country as possible. One of my favorite quotes was from Thomas Jefferson, “ the government that governs best governs least “. Have we forgotten that the purpose of government is to protect our freedoms that are endowed by the creator? I agree that the cost of health care has risen, but what hasn’t? The cost of autos and a host of other things have risen at a fast rate also, often because of the manufactures having to comply with government regulations. We Americans have a habit of being willing to pay any price for something we want and complain about the price of the things we need. Now that the government owns General Motors, I wonder if the American people would tolerate the government telling them what kind of car and what color they need. I will bet that there would be the biggest revolt you would ever see if that were to happen, but many are willing to set back and let the government decide life and death decisions about our heath care. There may be a place for some government involvement in heath care, but it should be limited. One of the things that I found very offensive is the idea of end of life counseling. The patient, family and spiritual leader, not some government bureaucrat, should make those difficult decisions. Before any of us begin to place all of our faith in government just look at the track record. Social Security and Medicare are programs that were supposed to provide for all Americans, now both are a ticking time bomb that in my opinion will retire a long time before most Americans. We Americans like to be able to determine our own destiny. If we want to remain pro-choice in that aspect, we had better take a hard look before we embrace socialized medicine. If you want to contact Russell, or wish to subscribe to his email list, click here. I received the schedule for Congressman Dan Boren's town hall meetings from his office this afternoon. S. Arch Thompson Auditorium – 221 E. Adams Ave.
Muskogee Civic Center – 425 Boston St.
Pryor MidAmerica Expo Center – US-69 South and Airport Rd. It's good to see Congressman Boren decide to hold town hall meetings after all. Now, if only Senator Inhofe and Congressman Sullivan would follow suit, then all of the Oklahoma delegation will be holding town hall meetings during the August recess. Democratic Congressman Dan Boren announced today the addition of three public town hall meetings to a previously announced telephone town hall series. Boren said he's hosting the meetings "to broaden the discussion on health care reform and to gather input from constituents across the Second District." Boren's town halls are scheduled for August 18th in McAlester, Muskogee, and Pryor. Here's a quick update on the Coburn Town Hall meeting in Muskogee. Over 600 people were present, including representatives from all the Tulsa television media. The crowd was very friendly and pro-Coburn, at several times calling for Coburn to run for president. At the conclusion of the meeting, some people started to chant "Six more years! 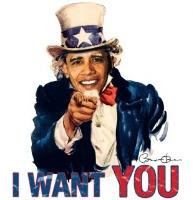 ", referring to another senate term for Coburn, who has pledged to run for only one more term. Nearly all of the questions were regarding the health care bills in Congress. Coburn said that he has read the health care bill, and "there's not a thimbleful of common sense in it." I highly recommend attending his town hall meetings. Click here for more information on where his other town halls will be held. UPDATE: Here are two pictures from the town hall. Coburn had to speak from the balcony. The huge crowd. This does not include those who were above or behind Senator Coburn. (WASHINGTON, D.C.) – U.S. 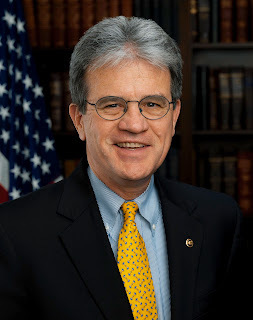 Senator Tom Coburn, M.D. will be holding a series of town hall meetings in Oklahoma throughout August. Dr. Coburn will take questions and address important issues for Oklahoma and the nation at each event. “I encourage everyone to attend and participate in these town halls. These settings provide not only a chance for Oklahomans to hear my views on current events but also gives me the opportunity to hear directly from the people who I am representing in Washington,” said Dr. Coburn. Here's one elected official in Oklahoma who isn't afraid to meet his constituents. State Rep. Ken Miller (R, Edmond), chairman of the Appropriations and Budget Committee, has pulled out of the race for Speaker-designate (the precursor to becoming Speaker for the next term). The only candidate now is State Rep. Kris Steele (R, Shawnee), the current Speaker Pro-Tempore. "After much thought and positive conversations with Kris over the weekend, I have decided to not seek the position of speaker-designate and support Kris in his efforts to become the next Speaker of the House. Later today, he and I will be releasing a joint statement on our shared goal of moving our state and caucus forward. I am honored to have been a part of the conversation concerning future House leadership and appreciative of the encouragement I received. I look forward to working closely with Kris and each of you to advance our state and majority." OKLAHOMA CITY (August 10, 2009)—House Appropriations and Budget Chairman Ken Miller announced today his support for Representative Kris Steele to be Oklahoma ’s next Speaker of the House. "After having positive and substantive discussions over the weekend, I am pleased to announce my support of Representative Steele in his efforts to become the next Speaker of the House,” said Miller, R-Edmond. “While I am honored to have been a part of the conversation concerning future House leadership, I do not plan to seek the position of speaker-designate in the fall and look forward to working closely with Rep. Steele to move our state forward," he said. With no other House Republicans expressing interest in the position, Steele is likely to become the next Speaker of the House. “Representative Ken Miller is a valuable member and a talented legislator. I’m honored and pleased to have his support and look forward to working together with him to grow our economy and tackle the important issues facing our state,” said Steele, who is currently the speaker pro-tempore of the House. “The dialogue that Representative Miller and I have had will move the Republican caucus forward more unified than ever and that’s a tribute to his leadership,” said Steele, R-Shawnee. Speaker Chris Benge, who is term limited and cannot seek re-election, praised Steele and Miller as strong leaders and said House Republicans will be in capable hands. “This has been a very positive process and it demonstrates that Republicans have the ability to govern while smoothly transitioning leadership,” said Benge, R-Tulsa. Though Benge remains Speaker of the House through November of 2010, Republicans will formally vote on Benge’s replacement this October. The winner will receive the title of “Speaker-Designate” and stand before the entire House for election as Speaker in November of 2010. Miller's move was a little unexpected, even though most insiders have said for some time that Miller would not be able to beat Steele. This came after Miller waged a somewhat negative campaign in the caucus. Miller was the establishment candidate, and this defeat strikes a blow at the grip political consultants and other party insiders have had on the State House for several years, particularly under the tenure of Speaker Lance Cargill and Speaker Chris Benge. The following is a press release from Republican Congressional Candidate Dan Arnett. 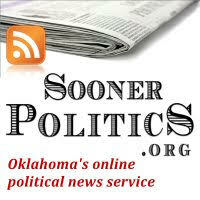 Stay tuned to the Muskogee Politico for the latest developments in the 2010 Second District race. The following is a weekly column written by Russell Turner, a Republican county commissioner from Adair County. Being from Oklahoma I have a strong admiration of one of our most famous philosophers, Will Rogers. During his life he also experienced an economic upheaval early in the 20th century. We Americans would do well to read some of the observations of the people that lived through the great depression. While technology has increased, human emotions and drives remain the same as they did all of those years ago. I once heard a quote by Will Rogers that went something like this, ” Americans are the only group of people in the world that ever went to the poor house in a new automobile”. Over the past week there has been a feeding frenzy over the CASH FOR CLUNKERS promotion for buying a new car. Maybe I am wrong, but I feel that the reason our country is in the financial trouble it is in today is because we Americans have a bad habit of spending more than we can afford. Many people have the goal of having a new car, while that is ok we need to remember an auto is just a tool to get us to work and do the errands we have to do. I was raised not to waste things like food, money, equipment etc. Whenever I see someone pouring a liquid into a perfectly good auto and destroying an engine, it seems like such a waste to me. Some of these so-called clunkers may not get as good gas mileage as some of the newer cars, but they could serve the needs of many people who cannot afford to buy a new car. We Americans far too often are ready to fall for a deal that is too good to pass up. This whole scheme is supposed to help pull the American auto industry out of a slump, but from the numbers I have seen the majority of the new cars being bought are foreign imports. Instead of getting more American manufactured autos on the road we will be having less. The cash for clunkers promotion will only give a short term boost, the only true solution is for government to get out of the way and allow American ingenuity and innovation to solve the problem and build the cars that the American public want instead of what some government bureaucrat thinks they need. I guess until then we will be on the road to the poor house. Call Congressman Dan Boren's congressional offices and demand that he hold town hall meetings in his district during the congressional recess in August. Dan Boren should have the political courage to meet with his constituents, and not hide during the August recess. Perhaps he realizes that he is not representing his constituents, and does not want to be held responsible. In tough economic times like today, it is important that cities encourage continued business growth. It can be difficult to achieve this, but one way is to avoid passing new ordinances that make it harder for businesses to expand. I live in Muskogee, Oklahoma. The recession took a while to hit our area, but the inevitable has occurred. As is the case across the nation, growth has slowed, and jobs have been lost. One would think that the city leaders would be doing everything they could to reverse that trend, and they are to a degree, but you would be surprised at some of the things city leaders can overlook. For example, in January of this year, the city council passed an ordinance effectively banning metal buildings from being built, unless the metal facade was covered in brick or some other material (or unless the structure is built in areas zoned agricultural, industrial, or for mobile homes). Most metal buildings are constructed by businesses for one simple reason: they are relatively cheap to build. A metal building is significantly lower in cost and faster in build time than conventional construction. One of the main reasons for this is that metal buildings are not very pretty. What is forgotten is that today's metal structures can be accessorized with various forms of facades or wainscots (which should be left up to the owner, not forced on them by government). Muskogee's leaders have, in recent years, been a little obsessed with making the town look nice, to the detriment of existing business. Another example of this was the portable sign ban ordinance that was struck down by the courts a few years back. And for another instance, see my post from June, when a rezoning request from a small businessman was denied. In the midst of economic turmoil not seen in decades, municipal leaders in my town are more concerned about how the city looks than about economic growth. A town can look as nice as possible, but still be dead economically. The council recently pushed for, and the voters passed, a sales tax increase (which mainly dealt with infrastructure improvements, with a bit of "pork", if you will). As a result, a businessman friend of mine now has his orders shipped to his property in the country, which saves him a lot of money since it is located outside the city limits. Just a few miles to the east, the small town of Fort Gibson takes a different perspective. Fort Gibson does not charge some construction-related fees that most cities do. The town has had substantial growth for several years, which might not be a total coincidence. Cities would do well to enact pro-growth measures, and eliminate hurdles to growing business in their town, especially when dealing with small business. In a time of recession, this is not an option - it's a must. Cross-posted at Cities of Vision - a think tank for cities. On July 31st, this blog reached another milestone - one full year in existence. I've just been so busy that I didn't realize it until today! From its inception on July 31st, 2008, this blog has had over 7700 hits, 187 comments, and such a wide variety of topics covered that it would bore you for me to list them all. 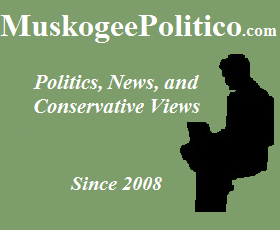 Thank you for reading my blog, and I look forward to another great year of discussing things with you on the Muskogee Politico! The following is a letter from Bobbie McAuliffe, a grassroots activist from Poteau. The U.S. House of Representatives schedule says the period from August 3 to September 4 of this year is the Summer District Work Period for our Congresspeople. This is the time when interested people in the legislative districts look forward to face to face meetings with those elected to serve us. Many of us who have attempted to find out when our chosen one will be in our area during the recess have been told he will not be holding town hall meetings this year. My question of “Why not?” has not been answered. Dan Boren should be reminded who he works for and that we deserve a progress report from him. It is not unreasonable for us to expect him to hold 2 meetings a week in the district during this period, is it? If you agree with me please do not just nod your head in agreement and say something like “I am glad you are doing this.” I am one voice. It will take many voices to turn his elitist thinking around and schedule some open meetings. I agree; Boren needs to grow a backbone, and face his constituents. He should be representing their interests anyway. By not holding town hall meetings in his district during the August recess, he is practically admitting that he only cares about the people around election time. On a side note, if any of my readers want to submit a letter or article, I would be happy to consider posting it. If any candidates or local party organizations have an event, I would also be more than happy to help publicize the event.